Keen Clean professional office cleaners will make sure your premises look clean and neat, both inside and out. No matter if you have a small office or run a large corporate headquarters, our office cleaners can meet all of your requirements. Just talk to our representative about your needs on 020 7101 43 25. We can schedule a visit to your office and provide you with a competitive price offer. How You Benefit With Keen Clean? Efficiency – you don’t waste precious time to check or supervise. Our local area managers and supervisors do. Planning – you choose when and how often our office cleaners visit your premises and they will keep your office neat and clean. 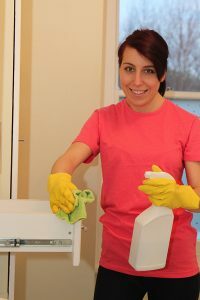 Budget-friendly – our prices for regular office cleaning are highly competitive. Just check what other providers can offer! A range of additional services to benefit your offices such as steam carpet cleaning, upholstery cleaning, and window cleaning. At first, you will talk to one of our office assistants to schedule an appointment with our senior staff. Then you are visited by our local area manager who provides you with a free price estimate. If you like what we have to offer and we have absolutely no doubts about it, we start working! You can book our services for a one-time deep cleaning or on a regular basis in a convenient for you time. You choose the service, we deliver it! Reliable office cleaning company can be really tough to find. However, you have come to the right place. We at Keen Clean are a reliable partner and can take care for your office in a proficient manner. Whether you need a service on a daily basis or a deep one-off cleaning for your premises, we can offer just the service you need. Our expert commercial cleaners can deliver on all aspects of the job in timely and professional manner. Call us now on 020 7101 43 25 to schedule a visit from one of our local managers. Thus we are able to provide you with an exact price estimate for our professional office cleaning in London. You can learn more about our experienced cleaners, tools, and materials we use in the cleaning process or working hours. You can ask about our office carpet and upholstery cleaning services as well in case you require more thorough and deep cleaning service.